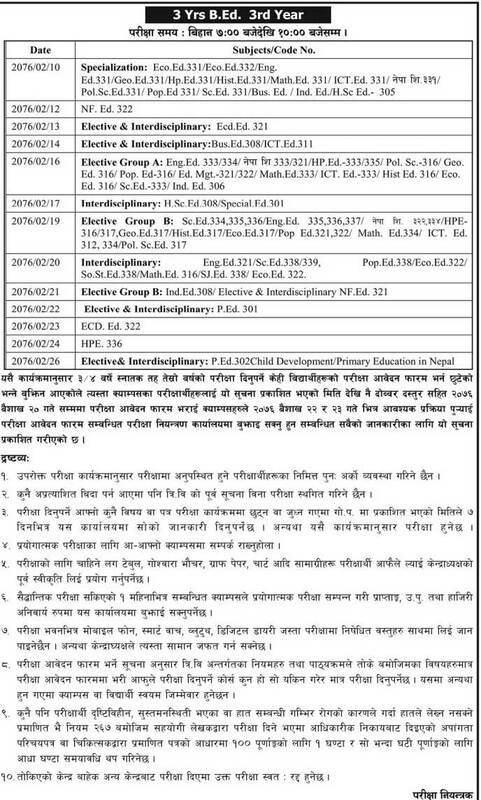 Tribhuvan University, Office of Controller of Examination, Balkhu, has published a notice regarding the exam schedule for 4 years and 3 years Bachelor Level Third Year 2076. This routine is applicable for regular as well as private students (both full as well as partial). > 4 Years B.Ed, B.Sc and BBS program: 12 to 3 PM. > 3 Years BA program: 12 to 3 PM. > 3 Years BBS and B.Ed program: 7 to 10 AM. The examination of 4 Yrs. BBS 3rd year 2076 starts on 2076/02/10 (MGT.204 Business Law) and ends on 2076/02/26 (MGT.218 Fundamentals of Taxation and Auditing ).